Ann Arbor City Council members decided to postpone action early Tuesday morning on a resolution asking the city attorney's office to cease enforcement against dispensaries. The reason cited for the two-week postponement was the fact that the meeting lasted past midnight and council members had just spent several hours debating another issue and were tired. Council Member Sabra Briere, D-1st Ward, is bringing forward the resolution on behalf of the city's medical marijuana licensing board, which is at odds with City Attorney Stephen Postema on what to do about dispensaries in Ann Arbor. The board claims it's trying to license them while it seems Postema is trying to aggressively shut them down. 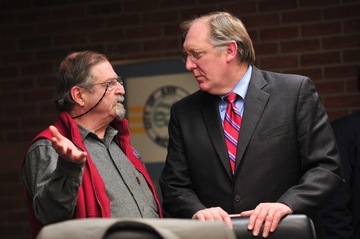 Ann Arbor attorney Dennis Hayes, who represents several local medical marijuana dispensaries, has a friendly chat with City Attorney Stephen Postema, right, Monday night. The city attorney's office is heavily scrutinizing dispensaries in Ann Arbor and recently sent them letters asking them to reveal detailed information about their business models in order to obtain licenses from the city. Dennis Hayes, a local attorney who represents most of the dispensaries seeking licenses from the city, had a friendly chat with Postema during a break in Monday's meeting. He spoke with AnnArbor.com afterward about how he perceives the situation. "We're not really sure what the city is after with regard to the letters they sent out," he said, expressing concerns that dispensaries are being asked to divulge information that could be used as evidence against them if the federal government ever decides to crack down on dispensaries in Michigan. "There's no way that the city can protect this information," Hayes said. "If they gather the information, on the face of it, it would be prima facie evidence of violating the federal law. Any acknowledgement by a patient and a caregiver that they're transferring medical marijuana is an admission of something that could be considered a criminal offense." The city attorney's office says medical marijuana dispensaries in Ann Arbor must be in compliance with the Michigan Medical Marihuana Act, but the city's medical marijuana licensing board asked last week: "How can dispensaries be in compliance with the MMMA when they are not even mentioned in the MMMA?" Hayes wonders the same thing. "The law doesn't mention dispensaries, so how is the city in a position to say something that's not mentioned in the law is something that the city has to deal with?" he said. Hayes said he's continually surprised as he learns more and more about the medical benefits of marijuana and all the various conditions it's helping people with. A state-registered patient himself, he said he uses medical marijuana as a pain reliever for his arthritis. "I've heard hundreds of stories of 'this helped with that,'" he said. "A woman I met just last week from Adrian, her husband had terminal cancer and had been in remission, and then he got the final diagnosis that it wasn't any good. She baked him some brownies and it made his last 30 or 60 days comfortable and pleasant and he was able to deal with his family and relate to them and talk to them about the fact that he was dying." Added Hayes: "At some point in time, that drip, drip, drip becomes a stream and it becomes a river of information about how this is helping people. I just can't understand why institutions are resistant to helping people." Postema says he has no personal agenda against dispensaries and that he's just trying to enforce the law. Wed, Mar 7, 2012 : 5 p.m. I keep, inexplicably, being censored for pointing out the facts about certain posters assertions. P v McQueen did NOT make dispensaries illegal. It is stated in the ruling that dispensaries are not mentioned in the Act, which is true. However, other than simply believing the misinformation conveyed from such people as Postema or Schuette, there is no binding law in Michigan anywhere that deems dispensaries to be illegal. The Justices in P v McQueen legislated from the bench, they did not properly interpret the law. This case is currently being appealed and the Supreme Court is expected to decide whether or not to hear it, soon. The ruling was actually very narrow and only pertained to a particular entity with a particular operating model that has not seen wide acceptance even well before this COA ruling. The ruling essentially said that because the word &quot;sales&quot; is not included in the definition of &quot;medical use&quot; in the Act, that when patients are acquiring and transferring with each other, it can not constitute a sale. It can be read, very clearly, in the ruling that all other combinations of transferring and acquiring have not been ruled on including patient to patient without remuneration. A circuit court judge in Barry County recently upheld the right for patients to transfer and savings from each other. Of course, Schuette is personally handling the appeal to the COA to be consistent with his strategy to deny rights and to disrespect the will of the people because it does not satisfy his personal biases. Please read the words of the ruling before believing anything and posting such dangerous assertions as fact. Wed, Mar 7, 2012 : 5:20 p.m.
<a href="http://www.onmedicalmarijuana.com/2011/11/30/update-people-v-mcqueen-supreme-court-appeal/" rel='nofollow'>http://www.onmedicalmarijuana.com/2011/11/30/update-people-v-mcqueen-supreme-court-appeal/</a> Read all the motions and briefs on People v McQueen. Jesus said to do unto others as we would have them to do unto us. None of us would want our child or grandchild thrown in jail with the sexual predators over marijuana. None of us would want to see an older family members home confiscated and sold by the police for growing a couple of marijuana plants for their aches and pains. If the people who want to use marijuana could grow a few plants in their own back yards, it would be about as valuable as home-grown tomatoes; it would put the drug gangs out of business and get them out of our neighborhoods. Wed, Mar 7, 2012 : 6:33 a.m. Yes dispensaries are currently illegal. A Michigan appeals court made the ruling in August of 2011. Google it there is an article on Ann Arbor. Com about it. I can't link it because I'm on my phone. I think its August 17 the. Wed, Mar 7, 2012 : 5:10 p.m. Pleas actually read the ruling before making such incorrect and dangerous assertions. Wed, Mar 7, 2012 : 3:51 p.m. Wed, Mar 7, 2012 : 1:10 a.m.
decaad is correct that the michigan courts have ruled on dispensary sales already. Haven't the posters read the articles on the court cases? I'm not sure why posters are claiming they haven't. If the med mar law needs to be added to to cover dispensaries then it might be wise to do that for many of the policy reasons. Maybe it is a good idea, maybe not. I will likely support the legalization law that is being proposed for Michigan. But it is silly to keep complaining about all the courts and attorneys who read the law and find that it doesn't cover dispensaries--when it doesn't. I had to laugh when the lawyer in this article, Mr. Hays, a lawyer for dispensaries, even agrees that the dispensaries aren't in the med mar law. To claim that, therefore, dispensaries should be allowed under exisiting law makes no sense. I would expect the city attorney and prosecutors to tell it straight. Just admit that the law isn't good and then change it. Don't demonize those who point out what the law actually says. Wed, Mar 7, 2012 : 5:06 p.m. This is not correct at all, and I question the motivation and sincerity of some who claim to be caregivers participating in the Michigan Medical Marihuana Program, who ate posting on this thread. Actual participants people are typically more aware of the important specifics of the functionality of the Act such as the difference between a recommendation and a prescription and the need and the plain language and the i tent of the voters that allow for transfers and acquisitions to take place outside of the primary caregiver/patient relationship. Wed, Mar 7, 2012 : 3:49 p.m.
Tue, Mar 6, 2012 : 5:30 p.m.
Tue, Mar 6, 2012 : 4:10 p.m.
Why don't we just fire the city attorney? Tue, Mar 6, 2012 : 8:24 p.m. Either he gets reined in by Mayor and Council (good luck on that) or he resigns. Firing is way too politically sensitive for politicians and particularly since Postema is a local. I think the pressure is slowly building and it's possible that MR Powers, the new administrator would be better served by a new attorney rather than the one who protected Roger Fraser, the previous administrator. Mr Powers might also be of the mind to privatize the City Attorney's work to save money. He's got my support for that. Tue, Mar 6, 2012 : 3:06 p.m.
Too bad these elected officials can't do their job, foot dragging on this and other issues won't accomplish a thing...quit whining and do your job!!! Tue, Mar 6, 2012 : 2:46 p.m.
Perhaps the law should have made it so that Doctors could prescribe marijuana. Maybe the doctors didn't want that because they could get busted by the Feds? This is a mess. Tue, Mar 6, 2012 : 4:24 p.m. It's only a mess because of people such as Postema and Schuette who refuse to consider the plain language of the Act and the intent of the legislature, who in this case, is the voters of Michigan. It should mean more to them, not less, that this law was put in place by the people, directly. The whole point of the Act and the mandate by the people, is for people to be able to participate in the medical use of cannabis. The opinions and interpretations of the Act that make reasonably doing that more difficult or impossible, have to be considered invalid. However, with the misinformation, restrictive and prohibitive opinions and interpretations,and political prosecutors and judges, the Act has been artificially deemed vague and confusing. Even proponents and those without and axe to grind begin to believe it. The truth is that the Act is clear and the people have put it in place and the people have carried it out and have made it functional including the safe access points being discussed here. It is quite all right to help carry out the spirit and intent of the act as the dispensaries in Ann Arbor do. it is NOT all right to prevent people from participating in the Act and relying on the rights and protections that it is supposed to provide. Schuette and Postema are only trying to repeal the MMMA any way possible, they have no regard for the will of the people, or the quality of life this Act has brought to tens of thousands of citizens, they just want it to go away. We can not let this happen. Tue, Mar 6, 2012 : 2:19 p.m.
Dispensaries are not mentioned in the law, only caregivers who can supply up to five patients. How do dispensaries work? Is it like a co-op where they have a bunch of caregivers who join together to buy the stuff and then each dole it out to 5 members? Could someone who understands this please explain? This sounds like the most poorly thought out change in State law ever conceived. I think the people (like me) who voted for it never had an inkling about the unprofessional way that it would be implemented. It's a joke. However, the horse is out of the barn now. I would still be for legalization of marijuana, though it turns habitual users into unmotivated slobs often. At least the profit motive would be relaxed as well and maybe we could figure out a way to tax it. Wed, Mar 7, 2012 : 6:46 a.m.
Dispensaries sell to anyone w a valid prescription. The legal justification had always been that patient to patient sales were legal. This argument was nullified when an appeals court ruled that it was not leagal. Most of the dispensaries owners are also caregivers to 5 patients and patients themselves. This means they can legally posses 15 ounces of marijuana. Most dispensaries have multiple partner or owners onsite during business hours this allows them to legally possess enough product to supply a large client base. They charge between 10-20 per gram and can buy product from large scale growers in California for as low as 1000 dollars a pound and grow it themselves for even less. The mark up is huge. The whole helping sick people get access to meds safely is just a guise they are ripping off sick people and making huge sums of cash in the process. I am a caregiver and make plenty of profit charging just 10 dollars a gram. I would support a change in the law that made dispensaries legal however until that happens we should not be licensing illegal buisnesses IMO. Tue, Mar 6, 2012 : 2:45 p.m.
Tue, Mar 6, 2012 : 2:40 p.m.
Caregivers/growers are allowed to produce (grow) legal quantities for five patients. A dispensary could be considered a caregiver/patient cooperative. Let's say that the dispensary has 100 caregiver/members. That dispensary is allowed to have 500 patient/members. Tue, Mar 6, 2012 : 2:10 p.m.
You would think the progressive leaders of AA would happily support medical marijuana. The reason why the mayor, through Postema, is trying to shut down MM dispensaries is, most likely, because they have been ordered to by the Obama admin. The Obama admin., against the will of the people, is hell bent on shutting down MM dispensaries and other natural health products while pushing dangerous GMOs and pharmaceuticals. What can you expect when Michael Taylor, former lawyer for Monsanto, is Obama's Food Safety Czar. Tue, Mar 6, 2012 : 2:06 p.m. I say that they should not fix something that's not broken. The law is clear about keeping the drug out of the hands who do not have a card. That is perfectly clear. I totally agree with this. If the dispensaries is providing a service to people who other wise can't get it, then the legal part of it is useless. MMMP card holders need to be able to supply themselves, and even with a care giver they can't always have it on hand. The care givers have to grow the stuff first, and then the client only gets a percentage of the plants and the rest goes to the care giver, which is to pay for the expensive cultivation process. I know people who cultivate and they don't always make money on their stock. Tue, Mar 6, 2012 : 1:15 p.m. If Postema wants to &quot;enforce the law&quot; then he needs to stop reading into it what isn't there and enforce it the way it's written. And that goes for AG Bill Scheutte. The authorities are allowed to enforce what the law prohibits but what the law does not prohibit, the authorities may not enforce. In other words, we are legally allowed to do whatever laws do not prohibit. The MMMA does not specifically prohibit dispensaries, therefore they are allowed to exist. Tue, Mar 6, 2012 : 1:02 p.m. Isn't there something better these empty suits could be doing? The courts did NOT rule against dispensaries! Postema and Bill Schuette do not personally like the idea that people are allowed to treat themselves with a safer, more effective alternative than toxic, addictive opiates and other pharmaceuticals. Postema and Schuette are abusing their positions of power to carry out their own agendas regardless of the law or the will of the people they purport to work for. The good people of Ann Arbor, those who operate and use the safe access points, currently under attack, and the Great Denny Hayes, are not putting up with it! Thanks to all of you, and please do not give up! Tue, Mar 6, 2012 : 11:28 a.m. The courts in Michigan ruled on this already dispensaries are not in compliance w mmma. The law states a caregiver can have up to 5 patients. I'm sorry some people took this to mean that they could open a store and serve as many patients as they wanted but that isn't the case. I constantly read how there is no resource to help patients and caregivers meet maybe their money would have been better invested in this type of business. The fact is these stores are operating outside of state and federal law and they have an unfair market advantage due to this fact that makes it very difficult for caregivers who follow the law to the letter to find and maintain pt relationships. These stores should be shut down or the law changed but. To allow certain people to break a law just because they don't like it is absurd. Laws are supposed to be laws not guidelines may or may not be takin into consideration. Wed, Mar 7, 2012 : 6:25 a.m. I'm a caregiver and I can tell that no they do not work hand in hand w local caregivers. Most import their marijuana from out of state because when you can grow more plants in states like California you can sell for much lower price. And also the courts ruled in the case of the dispensary in Oakland county that in fact patient to patient sales were not allowed under mmma and that any dispensaries operating under this business model were open to prosecution. There was an article on this website about it. I agree that safe access is key but until the law is changed to allow dispensaries then these businesses should be forced to close. Tue, Mar 6, 2012 : 1:46 p.m. This statement is a complete misfire in terms of the law, what it says and how it is supposed to be enforced. What is true is that the caregiver system must be preserved and improved upon until or unless Federal law changes. The safe access points work hand in hand with caregivers and totally support the system without compromising it.